Douglas Bushman is Director of the Center for Theological Renewal and Pope St. John Paul II Chair of Theology for the New Evangelization at the Augustine Institute in Denver, CO. He teaches courses on the New Evangelization, Catholic Spirituality, Vatican II, Ecclesiology, and Pope John Paul II, and is currently engaged in research on the pastoral theology of the Second Vatican Council and Popes Paul VI, St. John Paul II, and Benedict XVI. Following graduation from the College of St. Thomas in St. Paul, MN, with a B.A. in Philosophy (1976), he studied under the Pontifical Faculty of Theology of the University of Fribourg, Switzerland, and was awarded the Licentiate in Sacred Theology degree (1980). 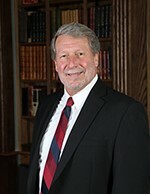 Prof. Bushman is past director of the Institute for Religious and Pastoral Studies (University of Dallas, 1992-2001) and of the Institute for Pastoral Theology (Ave Maria University, 2001-2004, 2005-2013). In 2004 he was Executive Vice President for Mission for Relevant Radio. He served as Director of Education for the Diocese of Duluth, MN, coordinating and teaching in programs of formation for adults, Catholic school teachers and administrators, catechists, and candidates for the permanent diaconate. He has contributed articles to a number of Catholic publications, including Lay Witness, Magnificat, Catholic Faith, Catholic Dossier, Catholic World Report, and Homiletic and Pastoral Review. He is the author of introductions for The Sixteen Documents of Vatican II (Pauline Books & Media, 1999), and the In His Image Program of Renewal through Education (Ignatius Press, 1989/1990). Prof. Bushman is well known for his content-rich and inspiring lectures, presentations, missions, and retreats. He also contributed to the translation of the Catechism of the Catholic Church into English. ← Speaker Biography: Right Reverend Philip Anderson, o.s.b.